Over the last few days, a lot has happened in the Indian Premier League. More than the close finishes, good cricket, something else too has caught minds of people - the on-field behavior of quite a few individuals who like all Indian cricket players have a huge fan following. 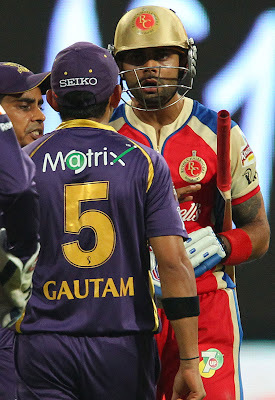 Yes, I am talking of the two angry young men of India - Gautam Gambhir and Virat Kohli. You will hear almost everyone saying that you need passion to succeed in whatever field you choose to play. Gambhir & Kohli both have that in abundance. Kohli well from his U-19 days has caught eyeballs for his temper. With MS Dhoni getting into the firing line for the whitewashes, we all started looking for the next leaders and it was these two who were the top two in the list. One reason why people wanted Gambhir to be captain was because he led KKR to their first title in IPL history. Kohli, an U-19 captain was doing an okay job with RCB too. And well this is exactly where it all started this year too. There have been occasions where Kohli has abused and yelled at fielders for their mistakes. There is an argument to counter that all players have their own way to captain teams. But as a player you yourself would not want to be abused by your captain in front of the crowd, live viewers who are watching every second. It does dent the confidence of the player. A stare, a quiet word at the end of an over to just let know the player that you as a captain did not like that effort and would want more of them. Well that’s more of a professional approach. Not saying this because we are used to see MS Dhoni being calm, or rather as few would say he does not even care to react. Yes, you cannot compare captaincy as a template but there is a way to respect every player who plays for your team. Gambhir did the same with Balaji when the later bowled a poor over at the end of the innings. He made his feelings let out clear during the match itself. Well not the behavior, one would ask but as they say it happens in the heat of the moment, but isn’t that the time where your real character & strength is determined? Both of them had an ugly spat too when KKR played RCB at Bangalore. Both of them mistook it for a boxing match waiting to knock the other one down. Not that one of them was at more fault, both were equally responsible for what happened. Both of them gave each other a piece of their mind when Kohli got out. What was good to see is that both played that incident down and kept it on the field. Since then Kohli has improved his behavior, not reacting wildly and that bad for mis-fields. Things are changing and they need to from both Gambhir and Kohli if either of them have any plans of standing a chance to be leaders. What hurts here is that fans who like them go bonkers when their player is being criticized and jump the gun. Kohli must have got a little shock when he was being booed and called “Cheater” for what was a pretty much legitimate run-out. People assumed it to be against the spirit which I still think struggles for its survival. We don’t call a batsmen cheat when he does not walk off despite knowing he had nicked it. There we take the word of the Umpire so why not here? Crowd had their own views and they came out harsh on Kohli. There were people who said Kohli deserves this for his attitude. Well, that reaction was more for what Kohli has done so far and not for the skills that he has acquired in fielding. This is what that image has done for both these players. Yes, their primary job is to score runs and play for India and they would not worry of what people think of them. It is important to realize that to be a successful leader and great Legend of the game, they need to work on their on-field behaviour for it will earn them more fans, the real supporters and the well wishers. They should definitely be what they are and must not change their nature completely. They just need to ensure that they don't lose their chance to lead the country just because of their short-temper, they must channelize their aggression in the right way and behave like professionals. It's not that I hate Kohli or Gambhir. I do not hate either of them, all I want and wish for is the betterment of Indian Cricket.